There is something satisfying in knowing that in a time when so many businesses have struggled and gone to the wall that some have prospered out of all recognition. The Kernel Brewery was the subject of one of my very first articles back in 2010 when I visited Evin O'Riordain who had just started to brew from a rail arch in Southwark, London. At that time, being a new venture, he shared the premises with two fellow artisan producers, a cheesemaker and salami manufacture. Back in late January this year I went to visit him once more to see just how things had progressed over that five year time scale - and how they had developed. I wanted to put some questions to him regarding the past, present and future direction as he saw it for the brewery. Evin always comes across as unassuming and modest, and what he WON'T tell you is that since The Kernel was established 5 years ago it has probably become one of the most influential breweries in the country - and particularly in London. The reason for this, quite simply, is the quality of the output. When I visited him five years ago there were in the region of 12 micro breweries established in London - today the figure is 70! He has moved on since those early days in Southwark a little further east up river to rail arches in Dockley Road, Bermondsey (along with the cheesemaker and salami producer who occupy premises next door). Changes at the previous location with a market out of sink with their artisan ethos necessitated a change. 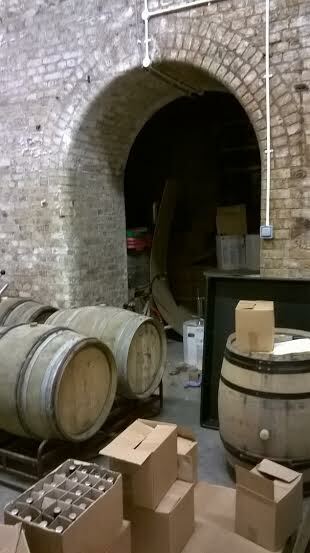 The difference now is that the brewery occupies three arches - a sizeable expansion to his business. As he showed me around it was clear to see how things had changed. The most noticeable of these was were the number of staff (of which there are now 12) and the number of mash tuns, fermenter's, a kegging facility, plus a semi automated bottling line had been introduced. All to meet the increased demand. Originally here he explained they had taken on two arches here but expanded into a third not long ago. Evin's philosophy is refreshingly egalitarian and all members of the team have an allotted day to brew. Rotation of roles also keeps the jobs from becoming to repetitious. It was noticeable that as a whole the operation had not become to automated. There is a tendency as breweries grow to see computerisation play a bigger role in production, but here the 'craft' element is maintained by the hands on approach of him and his staff. As he pointed out brewing is all a question of getting the timing right at each stage of the process. Timing also plays an important part in the working day, many micro breweries fall foul of the demands a brewing day can take, going from a labour of love initially, to an industrial chore. He is aware of this and try's to keep the working hours as sociable and sensible as possible so that they can finish at 6pm. The team spirit is important. I went on to ask him what inspired him initially to brew, and where he saw the future. Was there any specific beer in the past that provided that Eureka moment? "Not as such, but the brewing culture in the USA certainly impressed me" he said. Does he see the brewery expanding even larger than it is currently? "I think the size of the operation now is about right" he said thoughtfully. This would seem to make sense as the third arch with beer ageing in wooden barrels is all part of an ongoing experiment with taste and diversity. Was there any particular beer style he felt he needed to perfect, or saw as a challenge? "We tend to brew the beer styles we like to drink ourselves. The flavour of the porter and stouts are easier to predict than those of the paler brews". was his response. Certainly experimentation with different hop types and combinations is something the team enjoys, and harmonize particularly well. More than one Independent beer retailer has remarked to me that demand for The Kernel products is so high that it easily outstrips supply, but what is most important to Evin is maintaining his craft brew credentials, and quality of product. On that point the demand is certainly there as he receives requests for his beers from across the Atlantic in the US and New Zealand, but he is not tempted to export that far as the quality would suffer. Europe however he is happy to consider. As my trip came to an end it was heartening to see the progress made, and I asked him if he was happy where he was at, and what he had achieved. As usual there was a thoughtful moment, and a slight nod as response - with a smile. Modest to the end...but it said much more.